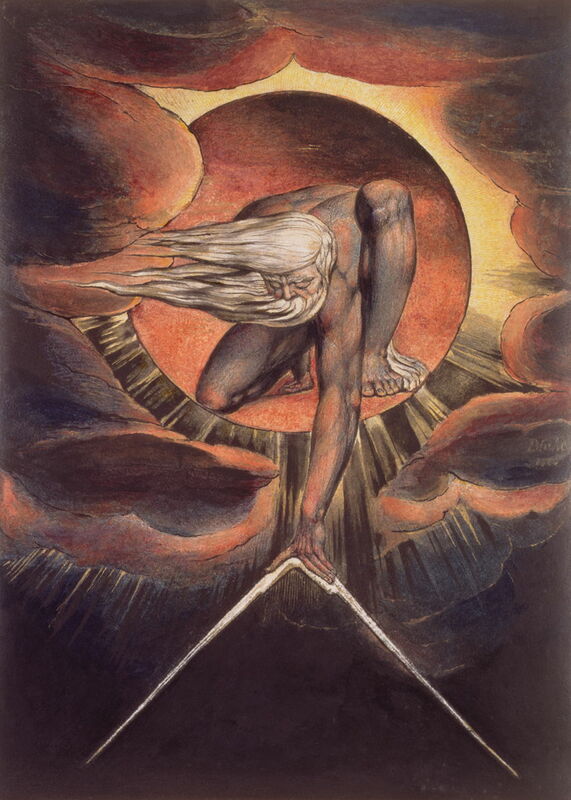 William Blake’s “Ancient of Days” (relief etching with watercolor), 1794. British Museum, London. We are accustomed to hearing that “God is love,” so it is jarring when we read in Joshua, “When the trumpets sounded, the people shouted, and at the sound of the trumpet, when the people gave a loud shout, the wall [of Jericho] collapsed; so every man charged straight in, and they took the city. They devoted the city to the Lord and destroyed with the sword every living thing in it—men and women, young and old, cattle, sheep and donkeys . . .. Then they burned the whole city and everything in it . . .” (Joshua 6:20-24). And so the pattern continues throughout the conquest and settlement of the Promised Land, with God encouraging—indeed, commanding—slaughter. When we first meet God in Genesis 1:1 he is called Elohim in Hebrew, a plural noun of majesty. In Genesis, God forms man out of “the dust of the earth,” and he interacts with him, walking with him in the “cool of the garden.” Genesis 1 & 2 portray the relationship between God and man as intimate and tender. Once sin enters the world in Genesis 3, however, God seems to distance himself from such intimate contact with humanity, preferring to stand afar and send messengers (i.e., angels: Hebrew, melech; Greek, angelus) as go-betweens. Later, as the plan of salvation unfolds, God takes on a seemingly different character as he commands the Israelites in Joshua to “totally destroy” the people who inhabit the Promised Land, and he is quick to punish with instant death any disobedience on the part of the Israelites if they fail to carry out his orders. As our story progresses, God brings a terrible judgment on Judah for its disobedience by using Nebuchadnezzar, king of Babylon, as his instrument of punishment. In a fearful siege, the Babylonians raze Jerusalem, kill thousands of people and carry the survivors into captivity. Jeremiah, who witnesses the siege from within the walls of Jerusalem, cries out: “Look, O Lord, and consider: Whom have you ever treated like this? Should women eat their offspring, the children they have cared for? Should priest and prophet be killed in the sanctuary of the Lord? . . . You have slain them in the day of your anger” (Lamentations 2:20, 21). As we study through the entire Bible verse-by-verse we do not have the option of reading only those stories we like or only those that make us feel good. Nor can we indulge in oversimplification and say that we have a “God of wrath” in the Old Testament, but a “God of love” in the New. Such thinking is not only sentimental, but it is incorrect. God says plainly in Malachi 3:6, toward the end of the Old Testament: “I the Lord do not change.” According to God himself, we meet the same God in Joshua and the Babylonian Captivity as we meet at the foot of the cross and the empty tomb. So, what are we to make of this God who seems at once loving and angry, patient and petulant, tender and wrathful? All people are complex creatures, and entering into an intimate relationship with another person reveals his or her complexities. So it is with God. As we come to know God in Scripture, we begin to understand the complex nature of a just, holy and righteous God who sees us clearly in all of our grotesque sinfulness, yet who sacrifices his Son that we may live. Such a God is far more than “love,” even in the highest sense of the term: he is a God of infinite holiness, of profound justice and of fathomless depths.